Designed to reduce material waste and maximize material control, the MILLERS FALLS stainless steel hopper spreader is the ultimate tool in optimizing material distribution and getting your job done easily. APPLICATIONS: Suitable for small to medium spreading applications and are capable of spreading a wide variety of products including fertiliser. seed, sand & salt. For use on sports turf, gardens, farms, public and recreational areas. 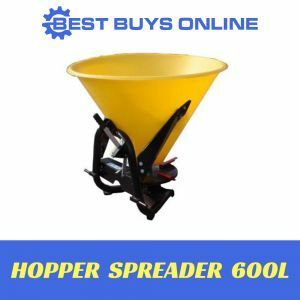 Low maintenance and rust resistant for long-life protection, the hopper is corrosion resistant with stainless steel hopper. PTO drive shaft with safety cover.